Uganda Cranes did Uganda proud on Saturday when they won the Uganda vs Guinea Bissau match in which they came out with 2 goals taking them to ten points in their group. The first goal was scored by Godfrey Walusimbi and the second goal by Geoffrey Massa. 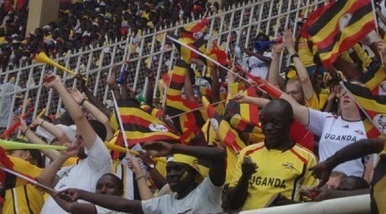 Kampala was all yellow as fans were clad in yellow attire in support of the Uganda Cranes. Saturday was the day police left all those blowing vuvuzella's, whistles, car horns all in the spirit of togetherness for Uganda against Guinea Bissau. Nambole Stadium was over subscribed as those with tickets could not sit and yet they were so many people stranded outside the gates. It could take up to two hours to make it inside the stadium and on getting inside, getting where to sit was another issue all together. It comes as no surprise for Uganda to win the Guinea Bissau vs Uganda game because there was massive support by Ugandan fans.